Finally… I am back at home and done with many of my speaking engagements so that I can get back to blogging! 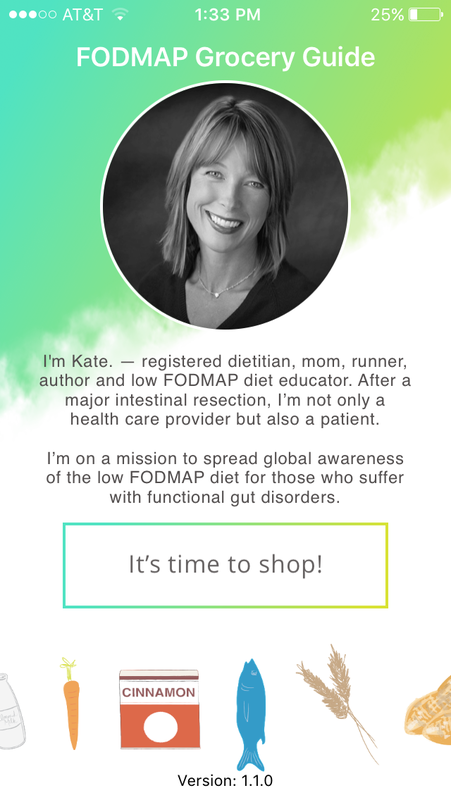 In case you haven’t heard yet…I had the good fortune of some very kind folks help me (actually they did ALL the heavy lifting) create a low FODMAP app. Honestly, creating an app had been on my wish list…but I just couldn’t set aside the time to get it going. BUT…sometimes life brings generous and kind people your way to make things happen…and my app people are Evan, Kari and Rod. One of my key goals as a FODMAP diet expert has always been to simplify the life of the FODMAPer. I firmly believe that a trial of the low FODMAP diet should not require a degree in biochemistry. 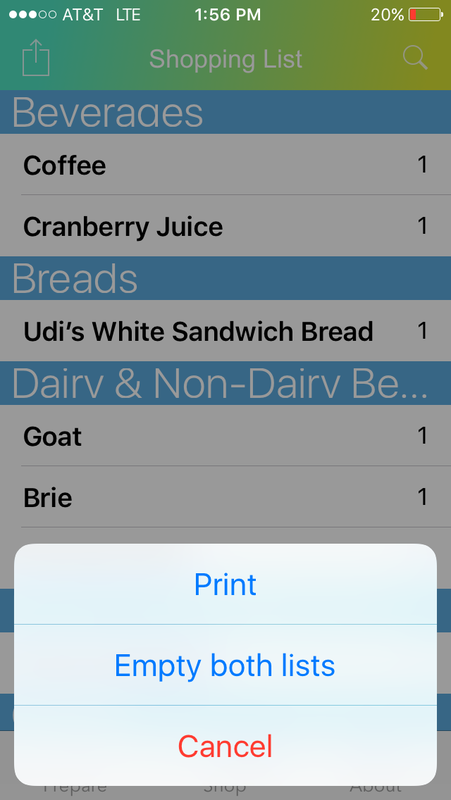 I thought a simple app to help make grocery shopping a bit easier would be a great tool for low FODMAP diet newbies. 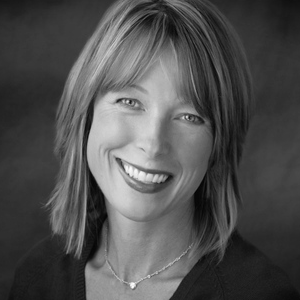 I am constantly trying to improve and simplify low FODMAP patient education tools and provide resources to make your lives easier as a FODMAPer. My downloadable app is called the Fodmap Grocery Guide . The goal of this app is to streamline grocery shopping for the low FODMAPer (and their family members & friends who shop for them) and minimize second guessing in the grocery aisles. I launched the app as part of the #IBelieveinyourStory campaign to support IBS awareness this April. All proceeds from the app will go to the creation of FREE patient & health professional education resources. In fact, we have been busy working on a simple (and cute) educational tool to guide school personnel and chefs. Stay tuned! You can find the app by searching for the Fodmap Grocery Guide in the iTunes app store. Currently the app is only available for iPhone/iPad. We hope to also have an android app version in the future. For those of you that have already purchased the app, thank you! 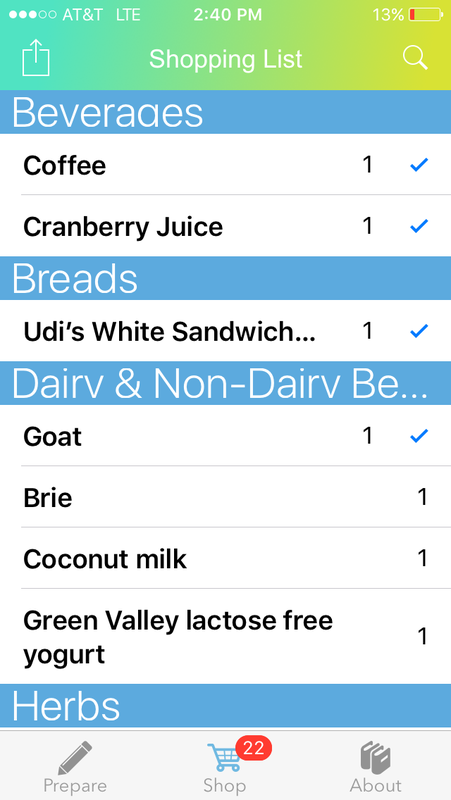 Today, I wanted to walk you through a quick tutorial of the app to create a low FODMAP grocery list. Several of my patients have also mentioned that they use the app as a quick access reference guide for what foods are low in FODMAPs. Please note we have included some brandname foods in the app (more to come, in the next update). Some of these items have not been formally analyzed for FODMAP content, however, have been used by my clients (and me) with good success while following the low FODMAP diet. As more foods become certified low in FODMAPs, we will include them with a specific designation so you know they have been ‘officially’ tested. So…let’s stroll through the app, shall we? Open the app and click on the “It’s Time to Shop” Button. As you see an item you’d like to add to your list you click on the + sign to the right of the screen. If you’d like several of the same item you double or triple click. To remove an item, hit the – sign. I’ve added coffee, cranberry juice and Udi’s white bread to the first page. (If at any point you get off the list screen just click on the pencil icon at the bottom of the screen that says “Prepare” and it will bring your right back to your list). As I scrolled down the list I add the amounts and items I needed. Here’s my menu for the day: Coffee with coconut milk to start the day along with lactose free yogurt with a smattering of cinnamon, 1/3 of a sliced ripe banana, dark chocolate chips, walnuts and coconut flakes. For a snack mid-morning, I’ve included a rice cake with peanut butter and a glass of cranberry juice. For lunch, a grilled Brie and tomato arugula sandwich with carrots on the side for some added crunch. For an afternoon pick me up I’ve included an iced coffee with a Clementine and gluten free cookie. During dinner prep, I chew on a couple pieces of Simply ginger gum. For dinner, I’ve grilled chicken and potatoes with rosemary and added a spinach, strawberry and walnut salad with goat cheese for a summer side. Sounds yum, right? When you are finished making your shopping list then click on the shopping cart icon at the bottom of the page with the word “Shop”. This will bring you to your compiled list. I have 26 items on mine. I can use this shopping list right on my phone and check off items I’ve added to my grocery cart as I shop. From the shopping page, I check off the items I’ve purchased by clicking on the number on the right hand side. This will add a check mark next to each of the items as I move down my list on my phone. Alternatively, if you’d rather print the list you can click on the box with an arrow icon in the top left hand corner of the screen. 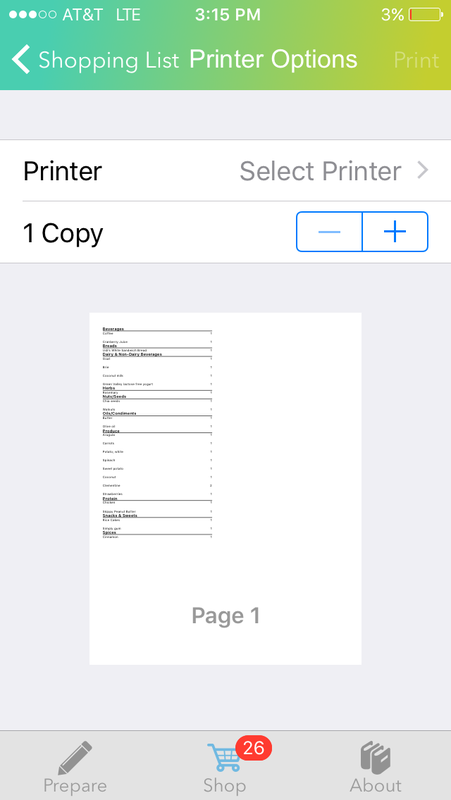 This will allow you to print the list to bring along to the store with you. From this icon you can also empty your working lists after you shop. The “About” page with book icons at the bottom of the screen makes resources from my website readily available for you. Whether you want to read about FODMAPs 101, look at my most recently updated high and low FODMAP checklists or find the answers to my patients most frequently asked questions. All of this and more is available at your fingertips in the app. 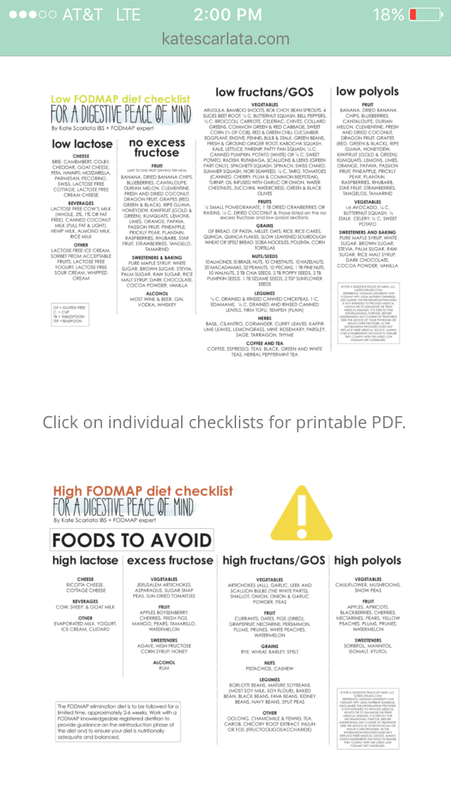 Below you can see the link to the low and high FODMAP checklists. As with any new specialty diet for food intolerance, following the low FODMAP diet guidelines can be complicated…especially at first. I recommend my App to be used in conjunction with other low fodmap guidelines from your registered dietitian and with the Monash University Low Fodmap diet App. 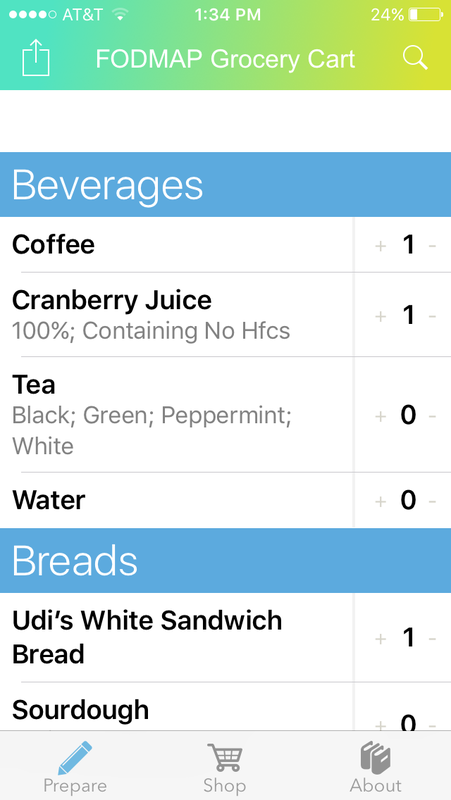 The Monash U low FODMAP app provides foods most recently analyzed for FODMAP content along with specific recommended portion sizes. Feel free to provide feedback about the app. Contact us at inquires@katescarlata.com. Of course, for additional recipe and weekly menu ideas and inspirations, search my blog under FODMAP recipes. Wonderful and congrats! Bought it. It’s also available in the App Store – not just itunes, btw. Is the millet bread in the app Udi’s millet bread? Great idea, but only having it for Apple users is very disappointing. Exactly why I don’t use Apple products. You should only have to create one App that works for everybody. I hear you, Karen. The developer that volunteered his time to create my app–is familiar with doing apple apps–so that is where we started. Hi Kate! I’m so excited to see that you created an app! I’m hoping that you can make the android version available soon so that users like me and my clients can take advantage of this wonderful app! Thank you Kate! Yes, Android version, soon, please! Thanks! This app should greatly help as I get so frustrated shopping for stuff. Having something with mfgrs names would be wonderful! This is so exciting Kate. I can’t wait to recommend it to my clients!